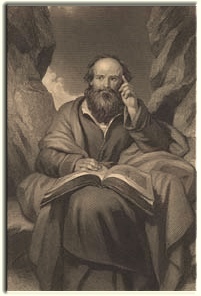 The books of reference used for this study of the book of Isaiah were the Bible, King James Version, called "The Companion Bible", Publisher Kregel; Strong's Exhaustive Concordance of the Bible, numbered to the Hebrew, Chaldee, and Greek, and English, coded to the Strong's Concordance numbers. Chapter 5 "Song of Yehovah, Parable of the Vineyard." Chapter 6 "The Voice From the Temple." "Divine Interposition: Messiah Comes. [1-7]"
Chapter 12 "Praise for Yehovah's Deliverance." Chapter 14 "Burden [warning] to Babylon and Israel." Chapter 15 "The Burden [doom] of Moab." Chapter 16 "The Burden [warning] of Moab; Pride." Chapter 17 "The Burden [warning to] of Damascus." Chapter 18 "Burden of Ethiopia." "The Burden of Arabia (11-17)." Chapter 22 "Valley of Vision, Persian Invasion [1-14]." "Israel: Judgment and Mercy ]15-25]." Chapter 23 "The Burden of Tyre; Former, Latter." Chapter 24 "Israel, Judgment and Mercy." Chapter 25 "Praise, the Destruction of Enemies." Chapter 26 "The Song of Judah." Chapter 28 "Woes. Alternated with Yehovah's Glories." Chapter 30 "The Egyptian League [1-17]." Chapter 32 "Yehovah's Righteous King: Desolation." Chapter 33 "The Assyrian Spoiler." Chapter 34 "Gentile Nations, and Armies." Chapter 35 "Yehovah, the King in His Glory." Rabshakeh (the first embassy), Reception of Message." Chapter 37 "Hezekiah's Reception and Action to Message." Chapter 39 "Isaiah's Message, and Denunciation of Hezekiah." Chapter 40 "A Voice from the Wilderness, The Gathering." Chapter 43 "Encouragement [1-7], Witnesses ." Chapter 44 "Idolaters, their Own Witnesses: Ignorance. The Smiths and the Carpenters." "God's Controversy with the Nations. Vanity of Idols." Chapter 48 "God's Controversy with Israel." Chapter 50 "SIN: The Cause of the Separation." "The Breach, the Cause [1-4]." "The Breach, Healed by Messiah "
Chapter 51 "The Call to Hearken, Awake." Chapter 52 "The Call to Israel; "Awake". " Chapter 53 "Messiah's Propitiatory Work." Chapter 54 "The call to Sing; COME." Chapter 55 "The Call to Sing, and Come; Comfort Given." "Reasons for Yehovah's Faithfulness: [1-8]." "The Call to Israel's Enemies [9-12]." Chapter 57 "The Call to Israel's Enemies, The Wicked." "Sin the Cause of the Breach [1-14]." Chapter 60 "Zion: Reconciliation, Restoration, and Enlargement." Chapter 61 "Messiah in Person." Chapter 62 "Messiah in Person, Prayers Offered." Chapter 63 "Messiah. In Person, Judgment." Chapter 65 "The Answers Given." Chapter 66 "God's Answer. Given, New Heaven and New Earth."